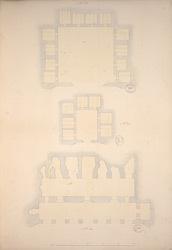 Pen-and-ink and wash drawing of the ground plans of Caves 12, 11 and 14 at Ajanta, from an album of 26 ground plans of the Ajanta caves and 16 folios of drawings of sculpture and architectural details in the Ajanta caves, by Capt. R. Gill, dated c.1850. The magnificent cave temples of Ajanta are situated in a horse-shoe valley of the Waghora river in West India and consist of prayer halls (chaityas) and monasteries (viharas), built for the Buddhist community who lived there. The first group was excavated between the second - first centuries BC; then, after a period of more than six centuries, the excavations restarted around the fifth century AD, under the Vakataka patronage. Cave 12 is a monastery which was excavated in the second century BC and it is probably one of the first excavations at Ajanta. The facade has collapsed and reveals the plain interior square hall. Cells on three sides have rock-cut beds. Cave 11 is an unfinished monastery from the fifth century. It consists of a verandah with columns that leads to the hall where there are four columns. The shrine has no antechamber and it has a stupa carved with a Buddha image. Cave 14 is late monastery from the fifth century that was planned on a large scale but was never completed. The columned verandah leads to the partially excavated hall.